This book is very disappointing in general and at close to 500 pages it’s way too long. I love Gibson’s “cutting edge” books, especially the “Bigend Trilogy,” and too bad, so sad, this is NOT the same. 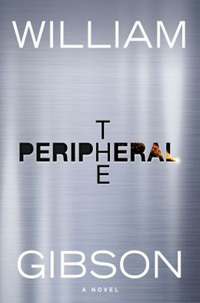 The Peripheral is much more old school science fiction partially set in a dystopian fantasy with gadgets and lingo galore. It’s typical Gibson in that there are several plot threads which come together late in the book and a few of the characters are compelling. And the big problem with reviewing it is that most of the plot-problems I had while reading are explained toward the end; I was confused for almost the whole book and by the end I really didn’t care. In the not-too-distant future, somewhere in southern Appalachia, a woman named Flynn plays-for-pay a beta version of a cyberspace game for her brother. While in this other world she witnesses a woman killed in a very bizarre manner. Come to find out she is being transported to a future time and far away location (London in “post-jackpot” times) to test something – but what? Flynn’s home world is made up of drug manufacture, drones, gaming, 3-d printables and government benefits. It’s not a pretty place. Getting away should be good but it’s not because the world she visits is involved in a meaningless race to the top of the power-pile. It came to be this way during or after something called “the jackpot” which is never explained. This new world is where the “peripherals” exist. Unfortunately she brings a peripheral back to the present and that brings the power-war of the future into the now as well. I’m reminded a bit of Snow Crash – the corporations own all and have their own ways of power. But I loved Snow Crash – that was fun. This was tedious. I’m not going to go further with this – I finished the book, but barely. Bottom line is that it’s just way too sci-fi war, lingo and gimmicks for me.